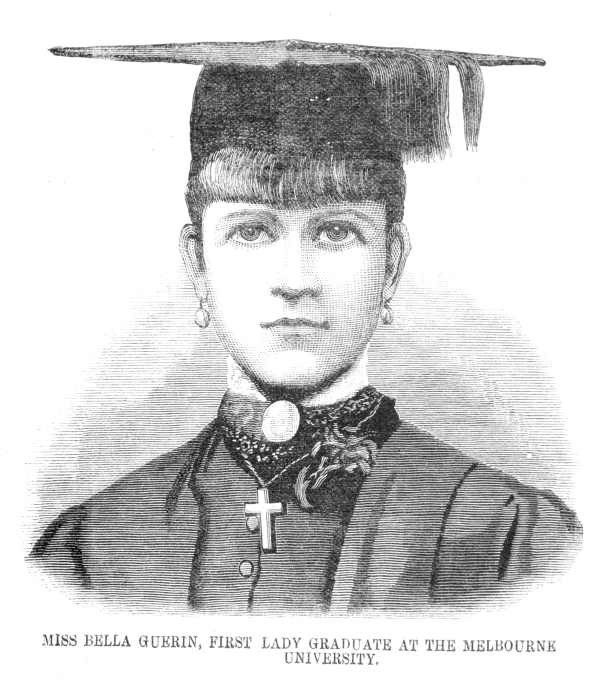 Julia Margaret Guerin, known as Bella Guerin, became the first woman to graduate from a university in Australia, when she graduated from the University of Melbourne in 1883. Miss Bella Guerin, first lady graduate at the Melbourne University, IAN24/12/83/204. There were also three other women who started their degree in 1881, however Bella was the first to graduate. Her achievement was widely reported in the newspapers, the Argus reporting that ‘after receiving her degree Miss Guerin was enthusiastically cheered by those present’. She went on to obtain her Masters in 1885. After graduating Bella worked as a teacher, firstly at Loreto College, Ballarat where apparently she was often criticised by colleagues for being too proud of her degree. (3) Later Bella worked at the Ballarat School of Mines as Principal of Matriculation. Her contribution to the School of Mines was honoured in 1975 when a hall at the University of Ballarat was named after her. When she married in 1891, to poet Henry Halloran, she left teaching. However, shortly after the birth of her son, her husband died, leading to a return to teaching for financial necessity. Bella Guerin died in Adelaide on the 26 July 1923. 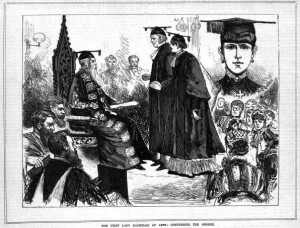 You can read about other notable academic women in Degrees of liberation: a short history of women in the University of Melbourne. The Library holds the records of the Victorian branch of the Australian Labor Party, which includes the archives of the Women’s Central Organizing Committee. We also hold many resources related to the University of Melbourne. Great article! Today its simply impossible to imagine the social stigma she would have had to cope with. I can only imagine she had an incredible personality and force of will. Just a heads up “Labor Party’s Women’s Central Organizing Committee (1818)” – I’m pretty sure that’s to be 1819, since its otherwise a little before she was born. Thanks for the heads up Mehmet – we’ve corrected the date to 1918.